I try to do a column every two months, though I do find it a chore because I'm a workaholic and hate being taken away from my work. Today my mood is not the very best, because yesterday my agent called and told me that publishers want only one thing from me, Xanth, and won't even look at anything else. I have done serious historical fiction, martial arts, hard hitting science fiction, limited nonfiction, and had two other fantasy series on the best seller lists in the past, but publishers have me typed for Xanth and that's it. This is of course idiocy, but it's the idiocy that governs publishing. It's not that I don't like Xanth; it's fine. I just don't want to be limited to it. Well, we'll see. I do have other resources, such as putting unsold novels on the Internet, so that anyone can see what my more ambitious or provocative projects are. Critics typically accuse me of not even trying to do anything significant, when actually my writing is about as varied and ambitious as that of any other writer. The limits are not in me, but in Parnassus, and in the perception of the critics, as is the case for most writers. The current example is Volk, at Pulpless.com and Xlibris.com; there may be more, in due course. Another reason I'm a bit down at the moment is that this morning I had more dentistry. I don't like having my teeth worked on, but I've had a lot of it, with 16 onlay/crowns and I think 9 root canals, including one that had to be cut out and rebuilt. This time it was a tooth that developed heat sensitivity: a mouthful of hot soup made it react. Not badly, but it's best not to wait until such things do get bad. Chances were that there was decay and gas building up that would one day bring real mischief. Well, it turned out that it was in an onlayed and root-canaled tooth, so had to be trouble down in the very tips of the roots of it. That meant ontodontic surgery: an apicoectomy. Ouch. So the endodontist cut open the gum, sanded down the bone, and filled the roots from below. Then he stitched me up again. No, it wasn't as bad as it sounds; I hate the stick of the needle, but after that couldn't feel anything. Now that the anesthetic has worn off, I feel a dull discomfort there, which is to be expected; my hope is that it won't get bad enough to require pain medication. I have kept most of my original teeth, but there's a fair amount of pain and expense in doing so. I hope I have seen the last of it, but doubt that I have. It occurs to me that there are certain similarities between suffering dental surgery and dealing with publishers: I wish I could avoid both, but do need what they provide. So what have I been doing, these last two months? Well, I returned to a project I started in 1996, Candle, about a house whose front door opens onto a busy city street and whose back door opens onto an endless pristine forest. I've always liked the forest, but also craved the comforts of the city, so in the course of my career have done various takes on possible reconciliation of the two. In Candle, a retirement-age couple is offered free rent for the first month in a very nice house. It seems like a bargain, but why did nobody else take advantage of it? Well, there are odd things about the house. It's not haunted or hostile, just weird in alien ways. They are intrigued, so they bring in their grandchildren, one of whom is a willful rebellious 15 year old girl named Llynn, and the other is a smart bratty 13 year old boy, her cousin Lloyd. The four of them explore the mysteries of the house, and things get stranger as they go: it becomes evident that mere human technology can't account for all of it. This is crafted as a potential TV series, each chapter an episode. I sent the first two chapters and a summary of the remainder to my agent in 1996, and he got some TV interest, but it came to nothing. But since this is a labor-of-love project, when I had time I returned to it, and now have a novel of 12 chapters, 70,000 words. We'll see whether there is any interest this time. I also got to work on chores. There are things I have been postponing for years, because - well, let me give you an example. Back in 1975 I allocated time to clean up my disreputable yard, and to put the piled papers in my study in order. I figured two weeks would do it. But the more I contemplated that chore, the more my imagination turned to fantasy. So I spent time instead working out a fantasy notion, and sent it off in summary to agent and publisher. It was approved, so I went ahead and wrote it in 1976, and it was published in 1977, as I remember. It's title was A Spell for Chameleon, set in the Land of Xanth. Right: the first Xanth novel, whose sequels were to transform my career and boost me out of the struggling pack of little-known writers. I considered, and concluded that my time had been better spent working on that novel than on my dismal yard and papers. So I resolved that if I ever faced a similar situation, to do the writing instead of the chore. So the next time it happened, and I had extra time, I skipped the chores and wrote Out of Phaze, which reopened what had been a closed series and gave me three more bestsellers. So it continued. But now, as my career ebbs, and publishers are no longer looking for anything from me other than one Xanth novel a year, I really do have tome to catch up on odd jobs. So I wrote Candle part time, and the rest of the time went to chores. It was the only way they were ever going to get done. So what were they? Well, we had converted my records of earnings on novels to the Access database, but thirty years of records needed to be checked for accuracy; there were duplications and omissions and errors. So I put some twenty hours into that, and now that list is more complete and accurate than it has been before, though some tantalizing errors remain. For example, there was an entry for Centaur Aisle in 1983 for $6,694.94. It couldn't be; the regular entries were there and documented, and this one wasn't. It must be for something else. But what? I couldn't find any missing entries for that period. It's a lot of money; I don't want to lose it, as it were. So that remains a mystery. But overall, I have a good record, now. I also caught up on my totals for the last three years income, so I have a better notion how much less I am now making than I used to. I dug out the printing calculator, and didn't remember how to operate it, and then it jammed, printing bunches of figures on top of each other, and one total didn't jibe with another or with the figures my wife had - in short, my accounts are just like yours. Reading puts me to sleep, but accounts wake me right up, and not pleasantly. Which is one reason I alternate the two. I also had outdoor chores. Our drive is three quarters of a mile long, through our tree farm, and trees and brush encroach, because that's where light is let in. We had some cool weather, so I took advantage of it to clip back the foliage, one to three hours a day, until it was mostly done. I also reopened overgrown paths around our lake shore. You see, our tree farm is about 90 acres shaped like the state of Florida, otherwise known as Xanth, a peninsula in Lake Tsoda Popka, all forested. Over the years the trails have largely disappeared. So I went out with heavy clippers and carved them back, so I could take our dog Obsidian (she appears as a character in Candle) on walks. She loves exploring, but I don't like being dragged through massed vines and nettles and thick brush. No, we don't let her loose in the forest; she would be too quick to make the acquaintance of rattlesnakes or alligators. So now we can walk without such problems. But there was a complication there. In the past few years feral pigs have moved in. Back in 1539 Hernando de Soto passed by this region, looking for gold; he didn't find the gold, but did leave something behind: pigs. They were for eating, but some escaped, and they have been in Florida ever since. Apparently the oinks concluded that after 450 years, our secluded tree farm was nice, so they moved in. But pigs are voracious animals, and they have torn up whole acres of our forest floor, making the region look as if it has been plowed. We fear for the welfare of other animals, who will not be able to forage well after the pigs have eaten everything. We also fear for ourselves, because some of them are big boars, said to be 250-300 pounds with razor sharp tusks and bad attitudes. We could hear them crashing and squealing in the brush. So my wife wouldn't let me go out too far into the forest, lest I get gored. Wives are like that. But I confess that when I stand amidst the destruction and hear a sound, I do get a mite nervous. So we need to be rid of those pigs. So we made a deal with a neighbor, and he is trying to lure the pigs onto his property where he can catch them and make them domestic pigs. Sure, they will wind up on grills, and we aren't really comfortable with that, but if it's a choice between those pigs and the wild creatures we have tried to make a sanctuary for - such as gopher tortoises, a protected species - we'll take the tortoises. And we hope that soon I'll feel free to range the length and breath of the tree farm without concern about something else hogging it. But my life is not all chores and writing. Last year I was given a CD disk with 28 card games on it, and so when I got knotted up on something or other, I'd take a break and play some cards on the computer. When I managed to win one, I'd go onto another. Over the course of a generous year the wins mounted, and finally I was left with the toughest one: Gaps. Therein the cards are all dealt out in four rows, scrambled, and then the four aces are removed, and you play by moving a card into a gap, forming a new gap where it came from. But you can play only to an adjacent number in the same suit: 5 of heart next to the 4 of heart or 6 of heart, in order. The object is to get them all lined up in suits, 2-K. It's very limited, and soon you stall out with no legal moves left. First time I played it I hated it, but when I focused on it, determined to win it and complete the roster of 28, I got to appreciate it more. Over the course of ten days I played about an hour a day, and finally, gloriously, managed to win it. So I had conquered the roster. Now I don't play it much, but will do so when I need distraction. I'm sorry the CD didn't include some of my favorite card solitaires, like Accordion or Crazy Quilt, but maybe eventually there will be a sequel disk. I understand Microsoft will come out with a new program, Chrome, that enables great 3D graphics; I wonder how that would translate to card games? So what else is new? One daughter took their home brewings to the state fair and they won several ribbons and best-of-show. The other daughter got chicken pox, at age 27. Life isn't fair. I read some books, including one for just fun: Li'l Abner, a collection of the first year's comic strips. That comic started the week after I was born, back in 1934. I must say that that first year was okay but not great; in later years, when I was old enough to read it, it had some great stuff, like Evil Eye Fleegle, who could throw whammies with his eyeballs. I remember a sequence wherein he was demonstrating his powers, and someone asked "Is it true that a half whammy can melt a charging locomotive?" Fleegle said yes, and by an interesting coincidence a train was just approaching. So he let fly at it with half the power of one eyeball, and the next picture showed the locomotive melted on the tracks. That's my kind of comic strip. Maybe they'll republish all the fifty years or so if it, and I'll get to read it all, in time. 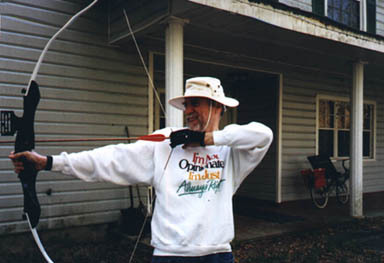 And of course I continued my exercise, including archery. My left side accuracy is improving, and one day when I fired both right and left bows at 100 feet I made 11 of 12 hits on the target with both bows. But next time the light was such that I had to go to 50 feet left handed, and I made 12 for 12 at 100 feet right handed, and only 9 of 12 left handed. So you never can tell. I think it's not the handedness so much as the fact that the right handed bow is compound, with the 60 pound pull reducing to about 20 pounds when drawn, making it easier to aim. The pull on the left handed one is about 40 pounds at the point to which I draw it, but there is no let-off, so it's harder to hold my aim, and I may fire the arrows with different forces so that they strike high or low. Every so often I still get a fluke right miss, too: the arrow takes off on its own, paying no attention to where I aimed it. But I like the archery, and plant to continue it the rest of my life. No I don't enter any contests, and I don't shoot at any animals; it's just me and my target, twice a week. And my metal detector, to help find lost arrows. Thus my life in the months of FeBlueberry and Marsh, plus Apull Fool, when I wrote this column, no fooling. And the day improved: I suffered no bad pains when eating my soft cold food, and needed no pain pills, not detecting even any swelling in my sore jaw. Life will go on.